In the previous post, I wrote about 1 Cripplegate Buildings where new occupants could be seen every few years, but for the neighbours at number 2, the story is totally different. Two families plied their plumbing businesses there for the best part of a century. Tallis lists John Mason, but we will start with his predecessors, the Banners. In 1741, John Banner, the son of Peter Banner, a joiner of Frodsham, Cheshire, put himself apprentice to John Battin, a plumber of London. From John Battin’s will, we learn that John Banner was his “kinsman” and that one Elizabeth Banner was his sister-in-law. (1) Battin’s widow, Margaret, takes over the business after her husband’s death and also takes on John Banner’s younger brother William as an apprentice later that year. From Margaret’s will we learn that she was Peter Banner’s sister, hence John Banner’s aunt. John is named as joint-executor with Margaret’s sister Elizabeth and he is left “the residue of the estate”. (2) In other words, he gets the business. The Land Tax records at that time do not necessarily specify addresses; the assessors just went from house to house and noted the tenants down one after another as they found them in the order of their walk, only occasionally noting a side street or court. So, in order to work out an address, you need to look for those for whom you do know a specific address in any given year and work backwards or forwards from there. 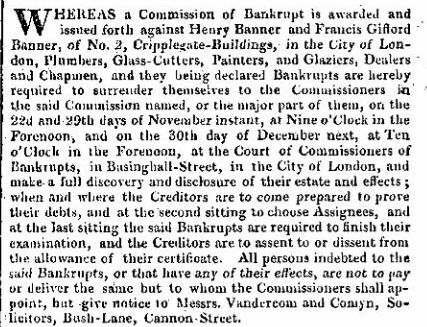 In Banner’s case, we can work backwards from the 1780 Land Tax record which does specify Cripplegate Buildings. Noting the neighbours and going back in time, it is clear that the shop he inherited from Margaret Battin was indeed 2 Cripplegate Buildings. 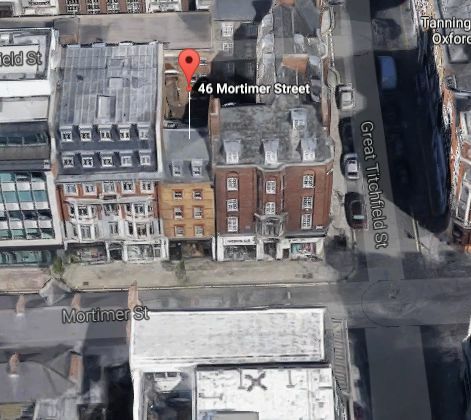 At some point, John (or possibly his son, also named John) acquired a property in White Cross Street, but when exactly is unclear. I have not found a marriage for John Banner, but on 13 April 1755, a son John, is baptised at St. Giles Cripplegate. The mother is just referred to as Mary. John junior is apprenticed to his father in 1778 and takes over the business when his father dies in 1788. 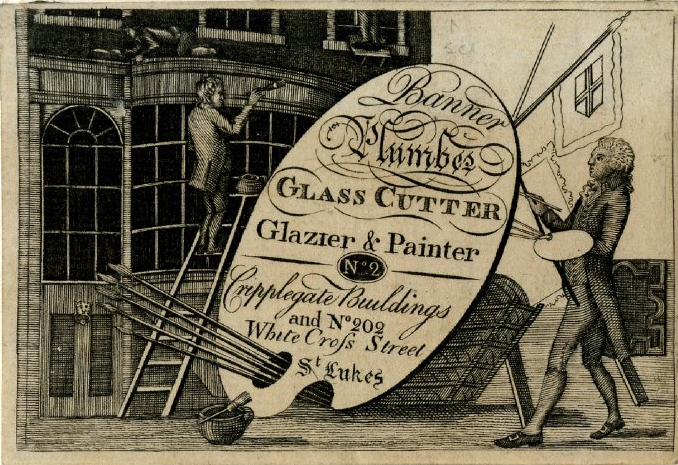 In Kent’s Directory for 1794, he is listed as plumber and glass cutter. John junior’s son Francis Gifford is apprenticed into the business in 1805 and duly takes over, together with his brother Henry. When John resigns from the business or dies is not known, but in 1818, the insurance for the plumber’s shop is in the name of Francis Gifford. In 1831, however, the brothers are declared bankrupt. They no longer seem to have the property in White Cross Street. The Land Tax record for 1832 lists the property as empty, but in 1835, we find John Mason there. 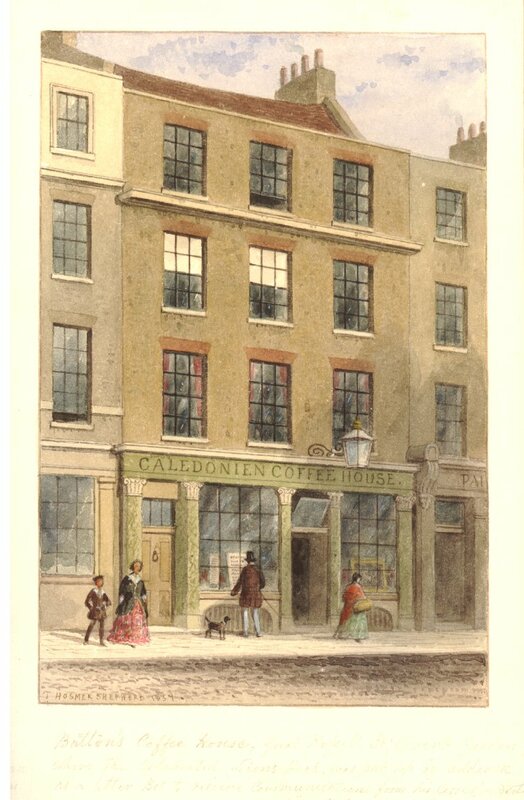 He had already been living and working at Cripplegate Buildings from 1827, but across the street at number 9. Judging by Horwood’s map (see here), number 2 was slightly larger than number 9, so a reasonable move. The 1841 census lists John Mason, his wife Ann, four children aged between 5 and 10, a female servant and an apprentice at the property. The 1851 census is interesting, because John is no longer just described as a plumber, but as “plumber, painter, glazier, paper hanger & builder” employing 25 men. The 1861 census lists John Mason junior and his wife Mathilda as the residents of the property. John is employing 20 men. Although it would seem that John junior took over the business from his father sometime before 1861, that is not the case. Father and son remained partners until 1867 when they officially “dissolved and determined” their partnership. 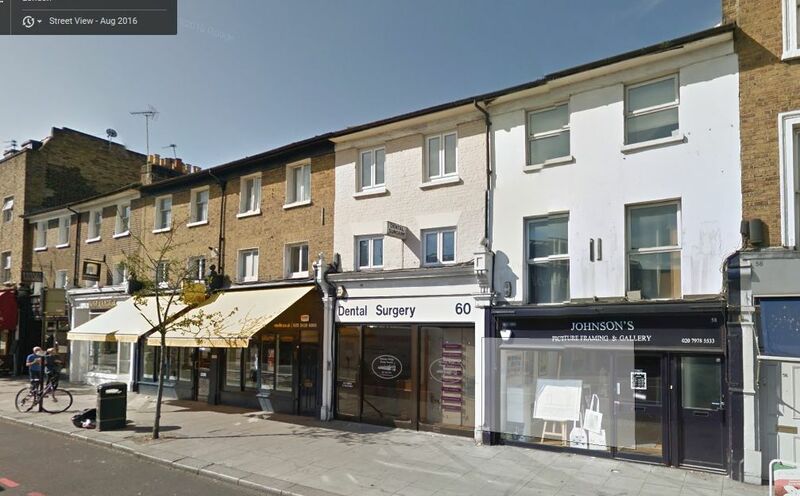 (3) John junior must have moved to Kent as in late 1867, Mathilda dies and her probate record gives the address of 19 Essex Terrace, Lee, Kent. (4) John is still at that address at the time of the 1871 census, still a plumber and employing 17 men. Also listed are Eliza, his second wife, and children of both marriages: Mathilda (9 years old), Ruth (8), Edith (3), and Lizzie (1). 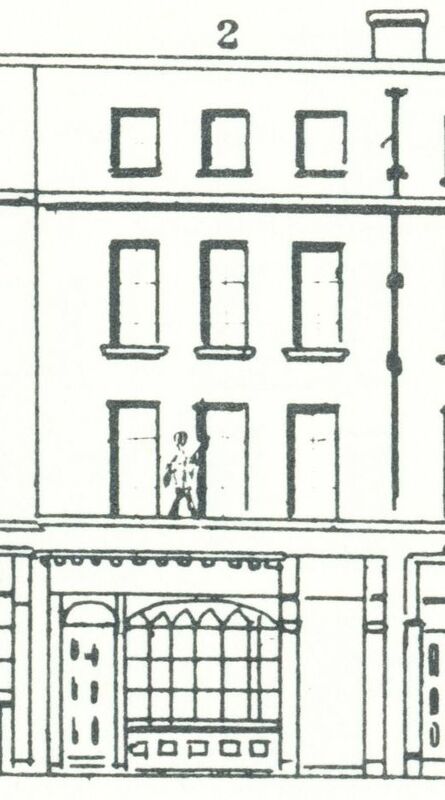 The 1871 census shows the Cripplegate Buildings property as empty. At some point Alfred Benjamin Catford and Frederick Brown, skirt factors, ran their business from 2 Cripplegate Buildings until they went bankrupt in 1879(5) and after that, the redevelopment took place described in the post on 1 Cripplegate Buildings (see here). And that was the end of the building as Tallis knew it. Do click on the elevation at the top of this post for a larger picture and enjoy the figure between the windows on the first floor waving at us. A naughty Mason child? A painter at work? Or an advertisement puppet of some sort? 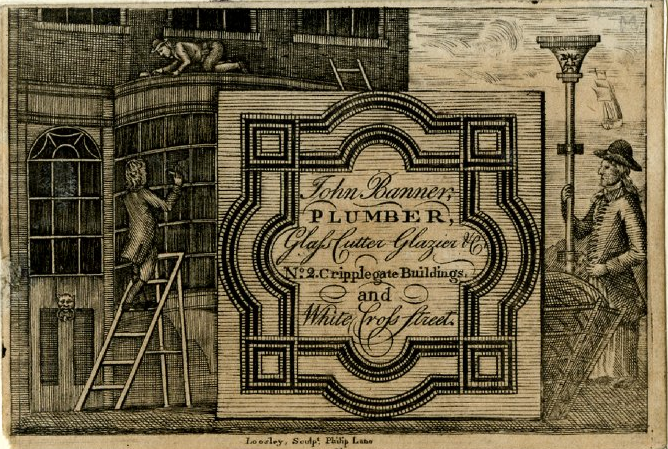 Also have a look at the trade cards where a figure is crawling on top of the bow window, although he is probably just fixing a leak in the roof. Whatever they represents, I thought them fun. (1) Prerogative Court of Canterbury: PROB 11, 746, dated 23 December 1740, proved 28 April 1748. (2) Prerogative Court of Canterbury: PROB 11, 784, dated 4 August 1749, proved 3 December 1750. 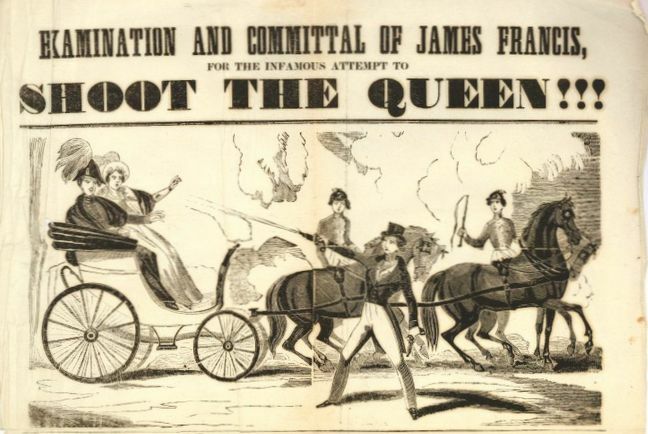 (3) The London Gazette, 8 January 1867. (4) England & Wales, National Probate Calendar (Index of Wills and Administrations), 1868. Estate valued at under £450. (5) The London Gazette, 30 September 1879.